Still need some inspiration when it comes to planning for your wedding this year? We share with you some of the biggest wedding trends for 2017, from the all important dress down to the finest detail of the cake and decor. Not a trend for the faint hearted or for the demure but the deep V-neckline was seen on the runway from Marchesa, the queens of uber elegance, to Reem Acra. The deep neckline creates the illusion of lengthened torso and is flattering whether you’re petite or more voluptuous on top. Bare shoulders remain a strong bridal trend throughout 2017 so if a revealing deep- v front is not up your alley then perhaps try a flash of shoulder for sexiness at its most subtle. Even the long sleeved gowns seen at Vera Wang, perfect for winter weddings, started beneath the shoulders. Delicate wisps of feathers were seen on the runway from Oscar De La Renta to Pronovias. Think strategically placed plumes perched on the shoulder, around the neckline or cuffs, or scattered around the hem for an airy, ethereal vibe as opposed to big bird meets snowman suit. With the Pantone colour of the year being Greenery, a ‘fresh and zesty yellow-green shade’, its not a surprise that this has trickled into the wedding arena and translated into the embracing of nature when it comes to the big day. 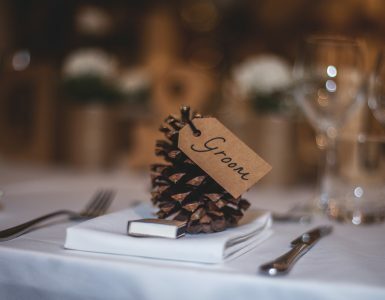 It’s all about trees (think olive, birch, and citrus), leaves (think ivy and eucalyptus), shrubs and potted succulents (great for table decor or wedding favours). adds a more modern feel to a wedding. Tropical flowers such as orchids and lilies with exotic palm leaves are a great way to incorporate bold colours. In stark contrast to the natural, rustic wood trend, metallics and mixed metallics (not just your standard golds and silvers) will be big for weddings this year thanks to the permeation of the copper and rose gold trend seen in home decor last year. The Pantone greenery aesthetics extends to wedding cakes too. Think tiers entwined with leaves and a scattering of dainty wild flowers combined with edible, realistic looking sugared blooms for a natural, earthy look. The naked or ‘nearly naked’ cake will continue to dominate at weddings this year. For those who are after a modern day wedding then a simple, ‘less is more’ cake is a must, a far cry from the traditional, heavily decorated cakes. Visible layers and cake filling is the name of the game as opposed to iced and concealed. Whilst a monochromatic, all white cake might sound plain and simple, it needn’t be so bland and boring on the eye. Think detail and dimension in terms of embellishment with cascades of dainty sugar flowers and delicate butterflies. A white on white cake is the perfect choice for contemporary or ethereal themed weddings. To find out what the biggest wedding themes of 2017 are, check out our Top 5 Wedding Themes And How To Achieve Them blog post.